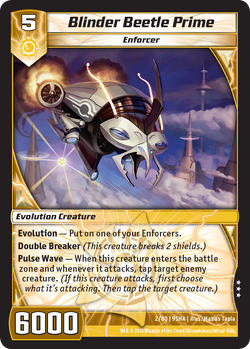 Blinder Beetle Prime is one of the best cards in Kaijudo right now. It is the best aggressive, tempo, and control card in the game. Being able to use it in all 3 of the main type of decks is why this card is so powerful. You can use it to tap blockers and go straight to shields or tap down 2 creatures and start picking away at your opponent’s battle zone. I think this card will see play for a very long time. It is just one of those cards that can help you get out of the most troubling situations. In the Winter Championship, I had 2 [ccProd]Aqua Strider[/ccProd], and an [ccProd]Andromeda of the Citadel[/ccProd] in the Battle Zone, with 2 shields. All my opponent had was a [ccProd]Rusalka Aqua Chaser[/ccProd] and a [ccProd]Keeper of Laws in the Battle Zone[/ccProd]. He played [ccProd]Rain Cloud Kraken[/ccProd] and evolved it into Blinder Beetle Prime and was able to tap both my blockers and break my last 2 shields, and since I did not have [ccProd]Stormspark Blast[/ccProd], he attacked with [ccProd]Keeper of Laws[/ccProd] for game. You may think you are in a safe spot, but that card can destroy even what seems to be the best defense. It can be difficult to deal with, but there are ways to stop it. I am going to discuss some cards that are obvious and others that players may have just thrown to the side, but do have a lot of potential. This is the best way to deal with that frustrating Beetle. The only reason I won game 1 against Carl Miciotto in the finals of the Winter Championship is because I discarded his Prime from his hand with [ccProd]Mesmerize[/ccProd]. [ccProd]Maddening Whispers[/ccProd] is also a really good card against decks that use Prime, the only problem is that you have to play it before they get a chance to play it, which can be a little tricky. I think creatures with this type of ability are extremely underused. The fact that they can trade off with any creature is a great strategy in any type of deck. If you have a Slayer in your Battle Zone when your opponent plays Blinder Beetle Prime, they are put in a very awkward situation. If they attack, they risk the chance of losing their creature on the following turn. There are also Slayers with great second abilities, like Tar Gusher, [ccProd]Goop Striker[/ccProd], and [ccProd]Freakish Test Subject[/ccProd]. Tar Gusher is my favorite one because being able to tap a creature when it is banished is a great ability. [ccProd]Gunk Up[/ccProd] works whenever it is banished, not just by slaying a creature. If you are afraid of Blinder Beetle Prime, try some of these little guys out and I am sure it will make a difference. Blinder Beetle Prime only has 6000 power. In order to make it less of a nuisance, all you have to do is play creatures that are more powerful than it. [ccProd]Caelum Skysworn[/ccProd] is a great defense against Prime. 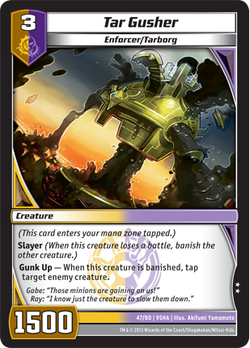 I know Prime can tap it and break shields while Caelum is in your battle zone, but you then can fight back by attacking over the Prime on your turn. Another card, that has not seen that much play is [ccProd]Fornax, the Juggernaut[/ccProd]. This is a massive creature only costing 6 for 8500 power. He is the strongest 6 drop in the game. If your opponent can’t answer this giant creature you will probably be able to attack over everything they have. Fornax has higher power than [ccProd]The Hive Queen[/ccProd], which is why I like him so much. The best way to use him is with [ccProd]Oathsworn Call[/ccProd], being able to play an 8500 Blocker on your opponents turn will generate a lot of advantage for you. This card is just good against any Evolution creature. They do get to attack the first time they play it, but once you play Rusalka, you can lockdown their creature every turn. I like to hold this card in my hand until they play Blinder Beetle Prime or The Hive Queen, and then I am able to stall them out for a while until I can get a way to remove their creature. Sometimes it may seem impossible to deal with cards that are causing you a lot of problems, but you just have to think outside the box. There are probably cards out there that players have not tested and turn out they work very well against other cards. It is also fun using cards that no one normally uses because they are going to get thrown off because they are not sure how to play against them. 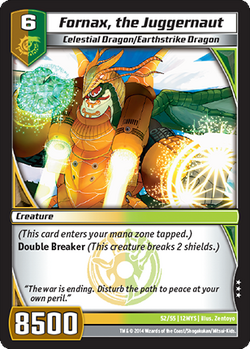 Blinder Beetle Prime is not the end all be all of Kaijudo. It is a very good card, but there are other cards out there waiting to be discovered that could be just as good. Remember it’s not all about winning, but having fun. Click the picture below for all the details for this weekend's ARGCS in Richmond, VA!